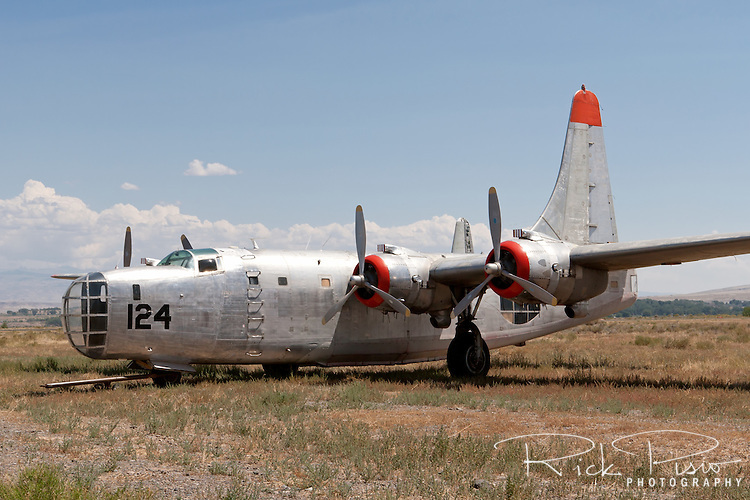 Hawkins and Powers PB4Y sits in the Greybull, Wyoming, storage area. BuNo. 66300, N2872G, is a PB4Y-2. First built in 1943 The Privateer was used primarily in the the Pacific Theatre for long range patrols. Hawkins and Powers used a number of Privateers for aerial firefighting. The PB4Y-2 Privateer was based on the B-24N Liberator with modifications specified by the Navy for a patrol bomber. The most noteable difference is the tail section. The PB4Y also did not have turbocharged engines since its role as a patrol bomber did not require it to operate at the altitudes that the B-24 did.